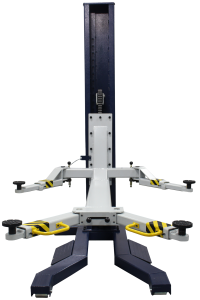 Is the MOBILEMAN® Single-Column Lift right for you? Let me tell you about our very popular mobile lift, the MOBILEMAN ®. We can’t seem to keep these in stock because of its potency, ingenuity and muscle … and it’s just cool. Perfect for a smaller shop with restricted floor space or a larger shop with multiple installed lifts and no more room! 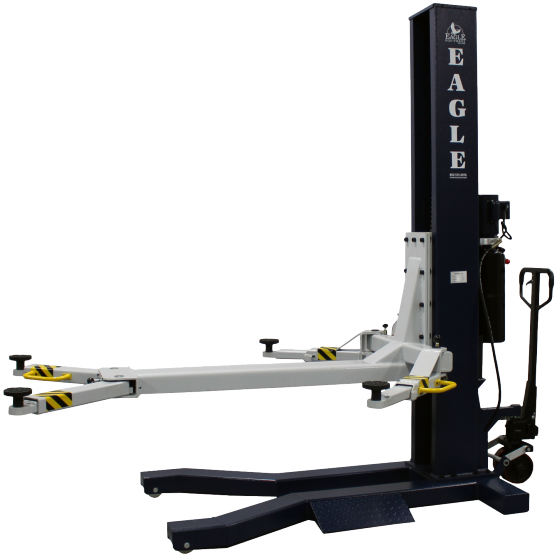 There are several mobile lifts, but ours is Exclusive only to Eagle Equipment, the MOBILEMAN® features an innovative design with a single column and a mobile “pallet jack” style that allows you to move it anywhere you need it. With its single-point lock release, 4 sets of truck adapters, and ease of maneuverability this lift will get the job done with a convenience that is unmatched. It’s so easy to operate. It works by simply pumping the handle a few times to lift it off the floor, making it easy to move into position. 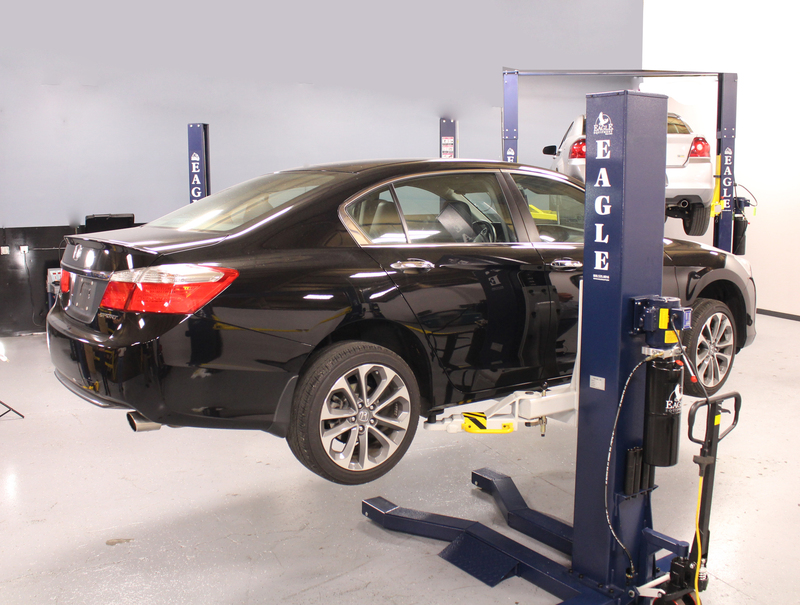 Using the Eagle Equipment Power Unit (included and installed on the column), it effortlessly lifts vehicles up to 6’ off the ground. When you’re done, pull the safety lock release on the column and use the handle on the power unit to lower the vehicle. It provides a full-rise lifting height, with portability. The hoist can be transported in and out of the garage, even into the yard to raise disabled vehicles. It offers virtually complete access to the vehicle’s undercarriage, and offers a strong 6,000 lb. capability. The MOBILEMAN® automotive lift is your unique alternative to everything else out there on the market today. Chain over design uses a 3″x36″ cylinder and 846-leaf chain. Is this the lift for you? Head over to Eagle Equipment and get started! Don’t take our word for it! Customers love their MOBILEMAN. Will the mobileman lift an Expedition? Curb weight is 5686. Was curious how close to the 6000 pound limit this lift can be pushed. Thanks! We would not recommend lifting an expedition. Just like with all lifts, the weigh distribution is per arm, so 6,000 capacity is only 1500 per arm. Considering using this in a small garage space to store a small project car (<2000 lbs) and park my daily driver under it. Do you recommend storing vehicles in raised position for extended periods of time? We do not recommend this lift as a storage lift as it wasn’t designed for that. You should check out our MS-8000 or the MS-8000XLT for storage. When will the Mobileman be back in stock? Do you make special order products? I need two of these with a shorter bottom frame, and the beam that reaches across the vehicle eliminated, with the arms slightly lengthened next to the stand. I am looking for a two post design in two portable columns able to lift 10K. Please forward to your design department. Mark, we do not customize the lifts for customer specifications. We don’t have the capacity to offer that at this time. Sorry. Hello, When will these be back in stock. I am very interested in the mobile lift. Very soon we hope! We’ll post more when we know.